#SportsinCbus: What’s Next for 2017? One of the great things about sports is there’s always next season. Well, next season – the 2017 every-conceivable-sports season in Columbus – is upon us. And, what a year this year will be, with many of the biggest individual stars, teams and events coming to the Midwest’s sports super city. To help me preview some of these events (there’s not enough space, even in cyberspace, to write about all of them), I solicited the help of the city’s sports experts: the staff of the Greater Columbus Sports Commission. This event is symbolic of the growth of women’s sports – at the youth, high school and college levels – on the national level, and right here in Columbus. The city has gained a national reputation for hosting big-time women’s events, culminating in the 2018 NCAA Women’s Final Four at Nationwide Arena. This is the first time Columbus has hosted this event. This event is unique, as it features the national quarterfinal games (March 21), national semifinals (March 22) and championship game (March 24). The games will be played at Ohio Dominican University’s Alumni Hall and will air on CBS Sports Network. This is the first time this event has been held in Columbus. It will take place March 9 to 19, and again in 2018 in Central Ohio. The NCAA Division I Women’s Volleyball Championships were held at Nationwide Arena in December. This is the first time the same city has hosted these two championship events in the same academic year. Columbus is renowned as a top destination for volleyball championships, with several other big-time events coming here in 2017 (keep reading!). 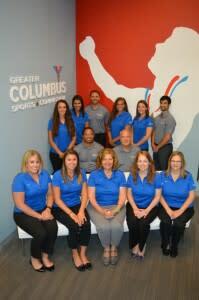 This tournament will be held July 1 to 8 at the Greater Columbus Convention Center. It will attract more than 15,000 players and spectators, and generate 22,000 hotel room nights and as estimated $13 million in visitor spending. Eric Archibald, Director, Events: “I am looking forward to the continuation of our city as the volleyball Mecca: Hosting the National Collegiate Men’s Championship, the second coming of the Junior Volleyball Association SummerFest, the largest boys’ volleyball tournament ever – the USA Volleyball Boys’ Junior National Championships and the North American Gay Volleyball Championships. The Junior Volleyball Association SummerFest is June 3 to 4 at the Greater Columbus Convention Center, which has hosted more volleyball matches than any other facility in the country. This tournament will feature more than 230 teams and 7,500 players (girls ages 12 to 18), coaches and fans. The North American Gay Volleyball Championships are May 26 to 28 at the Greater Columbus Convention Center and about 150 teams from the U.S., Canada and Puerto Rico and 1,000 players, coaches and fans are expected to attend. The race will take place April 29 on the streets of Columbus. This is just a small sampling of what’s ahead. Here’s the link to the Sports Commission calendar of events.